They are big, brash, uncompromising flowers, but I love them. 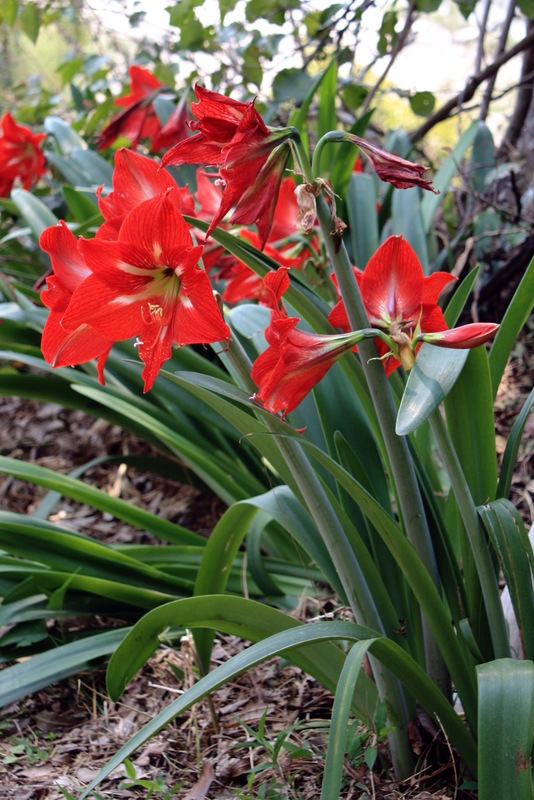 Hailing from South America, Hippeastrums are often confused with their South African cousins the Amaryllis. Quite how these stunning bulbs found their way to the remote valley in Bhutan where I took this photograph I don’t know. They seemed very much at home, forming clumps around the base of a rock in dappled shade. Back at home, in low terracotta bowls, our large bulbs are already sending up two or three stems each. Every one will carry four or five large velvety-red flowers, contrasting sharply with the bare branches outside the window. Well I’ll be darned. Your confusing statement about Hippeastrum/Amaryllis and South Africa/America sent me to google and the wonders of wiki… I never knew this was not bred from the indigenous amaryllis. What is more last year I discovered the amazing flowers quite unknown to me that were so plentiful in March in Cape Town were in fact called … March Lilies. I did not pick up (or at least remember) that they are the real Amaryllis! As a young child I visited the garden of a wealthy old lady who grew amaryllis and bearded iris and her nursery contained greater variety of each than I’ve ever seen again. Memorable sight, memorable person.